Hardy is shown looking right with powdered hair wearing the uniform of a master’s mate. 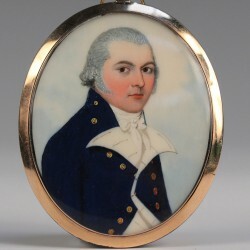 Watercolour on ivory, oval approx. 65mm x 5mm, framed in gold with pendent loop, reverse glazed and mounted with plaited lock of hair and applied gold monogram T.H. Thomas Hardy is the naval officer most closely associated with the life—and death—of Admiral Lord Nelson. He was present at all Nelson’s major fleet actions and served as the admiral’s flag captain in seven ships including Elephant at the battle of Copenhagen and, most famously, in Victory at Trafalgar where Nelson’s final dying request to “kiss me, Hardy” secured Hardy’s lasting fame. This newly-discovered portrait miniature shows 22 year-old Thomas Hardy at the outset of his distinguished naval career when he was rated master’s mate in 1791 in HMS Hêbé, 38 guns. It was painted by Frederick Buck in Cork probably at the artist’s studio on Fenn’s Quay. Hêbé was moored in Cork Harbour from 4 – 24 April, 3 – 4 May and 18 – 21 September that year. The sitting likely took place during the longest stay at Cork in April 1791. An account survives of the September 1791 voyage to Cork written by Admiral Sir William Dillon (1779-1857) who was then a young midshipman in Hêbé. He recalled having a berth on the larboard side of the ship and making the ‘acquaintance of four fine young men, George Cockburn, John West, Thomas Hardy and J.Laurence. The latter I lost sight of, but the three former rose to high rank and distinction in the Navy.’ They enjoyed good weather with frequent ‘rambles on shore’. 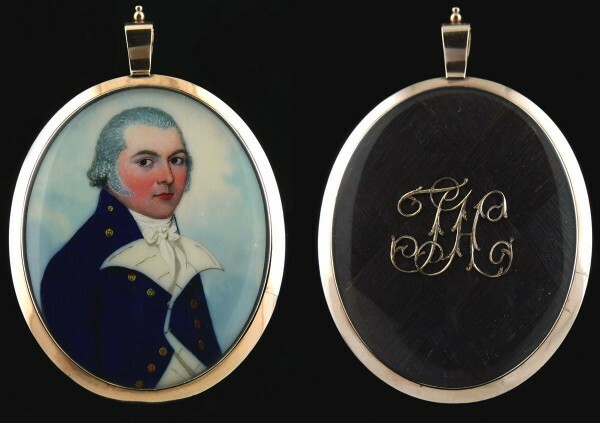 Mounted with a lock of Hardy’s hair and his monogram, this miniature may have been intended as a gift for a close family member such as one of his five sisters (Hardy’s mother died young), or preserved for later presentation to his wife. It is a very intimate relic of one of the Royal Navy’s most famous officers.